Heather: Brenda said that you killed your girlfriend. King: Yeah, well Brenda says a lot of things. And I believe about... none of them. I pretty much rented this movie because the cast on the cover was rather impressive, and one of the people I work for told me it was really good. 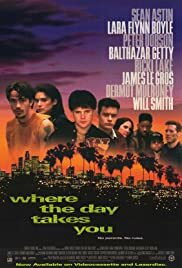 All I can say is, those people that raved about Kids have no idea what they are talking about, this is a much more realistic and true look at life on the street than Kids ever was. Small parts from Will Smith and Alyssa Milano (you won't recognize her till you see her name in the credits at the end) stand out strongly and Sean Astin gives a very good performance that is unlike most of the films you would see him in (Rudy for example). I really don't want to give away anything about the plot because I rented it not knowing hardly anything about it and I think that's the way it should be watched. This is just a flat out great movie.